We live in a time of game remakes and games that bear similar names. This phenomenon is not as young as we might think. Avalon Hill has remade several of its own games, most notably Gettysburg and Third Reich, which exist in distinctly different versions. I want to talk about two classic Avalon Hill games that have slightly fallen under the radar but deserve a second look. Both games are OOP but are available at ok prices. 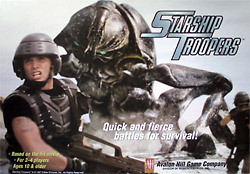 Both games bear the same title, and that is "Starship Troopers". 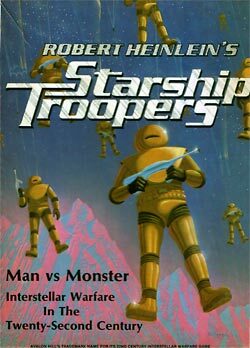 "Starship Troopers" is a famous novel by the American SF author Robert Heinlein. In it he develops a relatively reactionary view of the future in which only super soldiers who fight the alien bugs from the planet Klendathu are actually allowed to vote. But political views aside, this was a fabulous and slightly cynical SF adventure romp that introduced some new concepts to the genre, most notably the idea of a 1-man killing machine in a robotic suit. In the novel the bugs are so strange, foreign and powerful as opponents that the humans use technology that boosts the ability of the single soldier, in a way pre-shadowing the mecha-robots that later turned up in Japanese Manga SF. The suits are armed to the brim with rockets and turn single soldiers into an Ogre-like foe. They even perform ad-hoc surgery on the soldiers when they are wounded - amputating an arm or such and immediately cauterizing the wound. The whole novel can be understood as a thinly veiled allegory on the Vietnam war and is in many ways the opposite of the much more critical anti-war novel "The Forever War" by Joe Haldeman which has some similar ideas. It also most certainly inspired shows like Battlestar Galactica - hey the original series even had flesh eating bugs in the casino of hell, remember? Anyway, the wargamer is of course only interested in how the game plays, and for it's time the first, older "Starship Troopers" game was a valid effort with some things going for it. First of all it used a relatively new concept of rulebook, in which concepts where introduced bit-by-bit in a programmed way unlike the other rulebooks from Avalon Hill of the time, which were often a pain to read and understand. Once you learned the game this was a relatively complex wargame with some bookkeeping involved, and played on a rather bland and boring map. Usually the humans were in the minority, fighting it out with hordes of bugs and skinnies, the allies of the bugs, which usually serve as cannon fodder. An interesting game that is perhaps worth finding, even though it is probably not considered as a classic, but the only game that is faithful to the actual book. Fast Forward 20 years and Avalon Hill suddenly found itself as owners of a gaming franchise that was turned into a controversial film. Starship Troopers the film by Paul Verhoeven is either considered one of the worst SF films ever or a great parody of fascism and fanatic militarism (which is in fact my own opinion). The film takes many concepts and ideas from the book but also changes a lot. One of the most striking changes is that the bugs were made even deadlier, more powerful and especially faster, whereas the Troopers themselves are depicted as pretty poorly equipped army grunts who get slaughtered easily and in great numbers whenever the bugs attack. Still, some of the action in the film is first rate and intense, and the CGI effects were much above standard for the time and still stand up well today. Viewed in the right mindset this is actually a fun, if somewhat trashy film. Avalon Hill decided to make a new big box game to follow up the moderate success of the film, interestingly enough they avoided the more complex approach of the first game and made the new Starship Troopers game an introductory game for newbies with extremely simple rules. What was kept was the programmed approach that introduced new rules with each scenario, and the rather boring map. Gone are the tiny bland cardboard counters, instead you get stand-up figurines of both bugs and soldiers. These were produced in bad quality, though, at least my copy of the game makes it impossible to put anything permanently in a black stand, but that's another story. The scenarios are a set of skirmishes that are pretty much small scale compared to other wargames. Sometimes each player only commands 6 units per side, but Squad Leader this certainly ain't. Instead you get extremely basic rules where you have to roll hit dice and defending dice to the effect that most attacks immediately kill. The bugs mostly attack hand-to-hand (or rather claw to claw) whereas the human soldiers use meek carbines or, if they're lucky - tactical nukes. Each side has distinctly different strategies. The humans usually have to stay close together so they can concentrate their firepower once the bugs get close. The bugs usually have to hover out of firing range until they can surround the human soldiers in one big wave. As most shots immediately kill it only makes sense for the bugs to attack if they have higher numbers than the humans. Additional scenarios introduce concepts like brain bugs, tunnels and spawning points. All in all also a decent effort that will probably not satisfy the serious simulation fanatic but which would be an excellent game to introduce your kids to wargaming, as the rules are really simple to learn and explain. Another plus is that the scenarios play really quickly, usually in half an hour, and team play is also possible. I personally think it's one of the better efforts of the late Avalon Hill, and not as bad as many people think. If you are a fan of Heinlein - stick to the old game. If you look for the carnage of the film - stick to the new game. If you happen to like both film and book - why not try them both?